Psocomesites guangzhouense, from Li (2002). Contains: Trichadenotecnum, Trichadenopsocus, Loensia, Psocus, Psocidus, Ptycta, Indiopsocus, Mecampsis. The Psocinae is a group of barklice with the hypandrium composed mostly of a single segment, and the phallosome usually a closed frame (Mockford 1993). Characters (from Mockford 1993): Distal inner labral sensilla five or nine. Vein M forming distal closure of discoidal cell of forewing usually concave, sometimes straight. Hypandrium usually a single sclerotised sternal plate, sometimes with two small basal sclerites or pigmented arms on preceding segment; usually an asymmetrical central strap or tongue in hypandrial sclerotisation. Phallosomal skeleton usually a closed frame. Male paraproctal process cylindrical, tapering to an acuminate point. Li F. 2002. 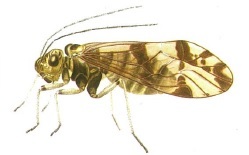 Psocoptera of China vol. 2. Science Press: Beijing. Mockford, E. L. 1993. North American Psocoptera (Insecta). Sandhill Crane Press, Inc.